in the direction from Louny to Dobroměřice before the Flood bridge on the left-hand side – through gardens, further in the municipality of Dobroměřice along an old road in the direction to Most. Behind the municipality (c. 1.5 km) on the right-hand side there is an access road to Stříbrník. by car (c. 5 min. ), from Louny to Dobroměřice, then along an old road in the direction to Most. You can use the road as far as the look-out tower. The Flood bridge, located on the way from Louny to Dobroměřice, belongs to a category of technical monuments. Its 40 spans were built during the Napoleonic Wars. 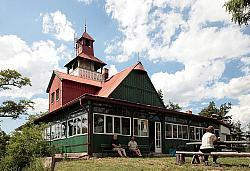 is located approximately two kilometres north of Louny. On the village green stands a one-nave Gothic church of St Matthew with a prismatoid spire added to the northern wall of the nave. The core of the construction dates back from the 2nd half of the 13th century. The church has been lately many times reconstructed. Last modifications were made in 1907. In the interior, a rib vault of the presbytery and remnants of wall paintings from the 14th century have been preserved. Not far from the church in the northwest direction there is an old school No. 5, dated by a classicist inscribed tablet with a Louny coat of arms of 1805. On the village green by the road to Nečichy, on a Baroque pedestal from 1736, there is a sandstone statue of St Václav, additionally set in the 19th century. At the crossroads of the main road to Bílina and the side road to Lenešice there is a sandstone pylon of an old milepost.